Honesty - If there's a problem I'll tell you, no BS excuses. Respect - I treat every project as if it were my own. Class - I do it the right way, because it's the right thing to do. I know these traits are hard to find in today's business world, but not at Left Field Engineering. Who Is Left Field Engineering? 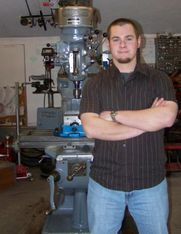 My name is Andy Gray and I’m a mechanical engineering tech who has been building things for as long as I can remember. As a boy, all of my projects seemed to end unfinished with the same problem: I could never find that one piece. That "one piece" changed from one project to the next, but it always involved equipment or skills that I didn’t have. Like most people, I dismissed going to a machine shop or welding shop with such a small project in fear that they were too busy, too expensive or too dismissive of a crazy kid with an idea. Since then, I’ve spent years accumulating the tools & knowledge to finish my projects. Realizing that I could not have been the only person out there who needed that special piece, I created Left Field Engineering. The go-to source for your project's missing part. Even if your project's missing piece is advise, after years of building things with every day items I’ve developed a capacity for seeing things as they could be, rather than as they are now.